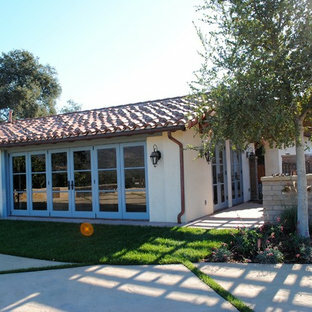 Various projects of Charles McClure Professional Site Planning in the Santa Barbara Ca. area. 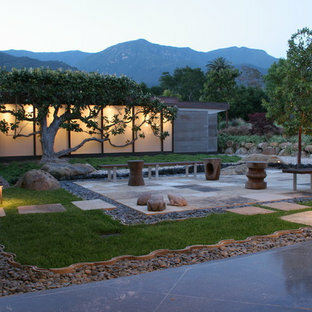 Photo of a large modern backyard stone landscaping in Santa Barbara. 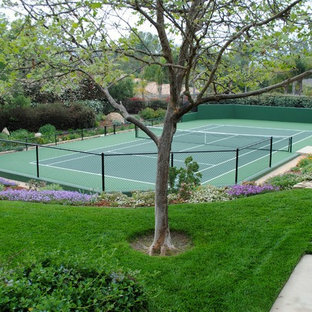 Photo of a large contemporary front yard mulch landscaping in Santa Barbara. Design ideas for a large modern backyard stone landscaping in Santa Barbara. 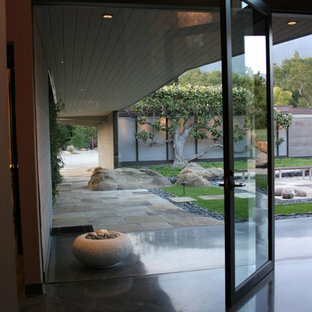 This is an example of a large modern backyard stone landscaping in Santa Barbara. Exterior Worlds was contracted by the Bretches family of West Memorial to assist in a renovation project that was already underway. 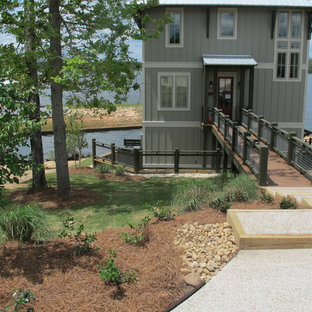 The family had decided to add on to their house and to have an outdoor kitchen constructed on the property. To enhance these new constructions, the family asked our firm to develop a formal landscaping design that included formal gardens, new vantage points, and a renovated pool that worked to center and unify the aesthetic of the entire back yard. The ultimate goal of the project was to create a clear line of site from every vantage point of the yard. By removing trees in certain places, we were able to create multiple zones of interest that visually complimented each other from a variety of positions. These positions were first mapped out in the landscape master plan, and then connected by a granite gravel walkway that we constructed. Beginning at the entrance to the master bedroom, the walkway stretched along the perimeter of the yard and connected to the outdoor kitchen. 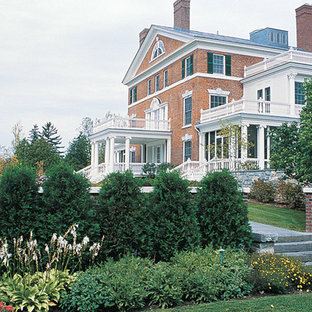 Another major keynote of this formal landscaping design plan was the construction of two formal parterre gardens in each of the far corners of the yard. The gardens were identical in size and constitution. 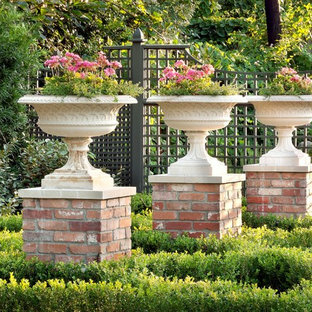 Each one was decorated by a row of three limestone urns used as planters for seasonal flowers. The vertical impact of the urns added a Classical touch to the parterre gardens that created a sense of stately appeal counter punctual to the architecture of the house. In order to allow visitors to enjoy this Classic appeal from a variety of focal points, we then added trail benches at key locations along the walkway. Some benches were installed immediately to one side of each garden. Others were placed at strategically chosen intervals along the path that would allow guests to sit down and enjoy a view of the pool, the house, and at least one of the gardens from their particular vantage point. To centralize the aesthetic formality of the formal landscaping design, we also renovated the existing swimming pool. We replaced the old tile and enhanced the coping and water jets that poured into its interior. This allowed the swimming pool to function as a more active landscaping element that better complimented the remodeled look of the home and the new formal gardens. The redesigned path, with benches, tables, and chairs positioned at key points along its thoroughfare, helped reinforced the pool’s role as an aesthetic focal point of formal design that connected the entirety of the property into a more unified presentation of formal curb appeal. To complete our formal landscaping design, we added accents to our various keynotes. Japanese yew hedges were planted behind the gardens for added dimension and appeal. We also placed modern sculptures in strategic points that would aesthetically balance the classic tone of the garden with the newly renovated architecture of the home and the pool. Zoysia grass was added to the edges of the gardens and pathways to soften the hard lines of the parterre gardens and walkway. Converted garage, trying to make it now look like that is the case. Craned in boxed oak tree. AV Architects + Builders Location: McLean, VA, USA Our newest custom modern home, located in the heart of McLean, Virginia measures just over 8,700 square feet. Situated on a beautiful lot on Old Chesterbrook Road, the modern home design takes advantage of the lot’s natural contours and sight-lines. Spread throughout three levels, the home contains five bedrooms, six full bathrooms, one half-bath, and a three-car garage. The main level of our modern home design features an open-floor plan designed to entertain family and friends. The entry flows into both the grand dining room and the central area, dedicated to the kitchen, breakfast and a double height great room that opens to a large outdoor deck with picturesque views of the expansive backyard. Located just off the garage is a functional mudroom that features plenty of storage space. In addition to a large home office and powder room, the entire left wing is dedicated to a private master suite with an expansive custom his/her walk-in closet, a master bath with a rainfall shower and a free-standing soaking tub with his/her vanities. The upper level of our modern home design features three generously sized en-suite bedrooms with full baths and closets with a full-size laundry room with plenty of storage space. The lower level of our modern home design also features an en-suite guest bedroom with full bath and walk-in closets amenities. It also includes an expansive recreational room with a glass enclosed wine cellar to house your prized wine collection. To finish out the lower level, we added a full exercise room paired with a full bath with direct access to the outdoor terrace and complimented the house with plenty of storage space. 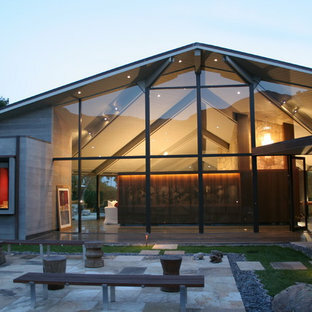 The materials we used for our modern home design are of the highest quality brands. We wanted to hand-select materials that would last for years to come, require little to no maintenance, and compliment the modern aesthetic of the home. The home features aluminum-clad oversized windows, Nichiha rectangular siding, and brick with a pastel finish; all brought together under a vacation style hip roof. Overall, we wanted to create a modern home design that feels like a retreat but still offers all the required amenities a family needs to keep up with the fast pace of Northern Virginia. The master plan for this south-facing woodland property celebrates dramatic topography, muscular canopy trees, remnant fieldstone walls, and native stone outcroppings. Sound vegetation management principles guide each phase of installation, and the true character of the woodland is revealed. Stone walls form terraces that traverse native topography, and a meticulously crafted stone staircase provides casual passage to a gently sloping lawn knoll carved from the existing hillside. Lush perennial borders and native plant stands create edges and thresholds, and a crisp palette of traditional and contemporary materials merge––building upon the surrounding topography and site geology. Photo progression of site model, part of a slide show presentation to the owners. Inspiration for a mid-sized mediterranean landscaping in Santa Barbara. 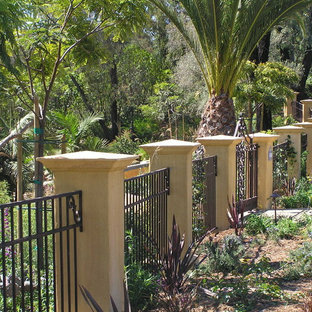 Inspiration for a large transitional backyard stone water fountain landscape in Santa Barbara.